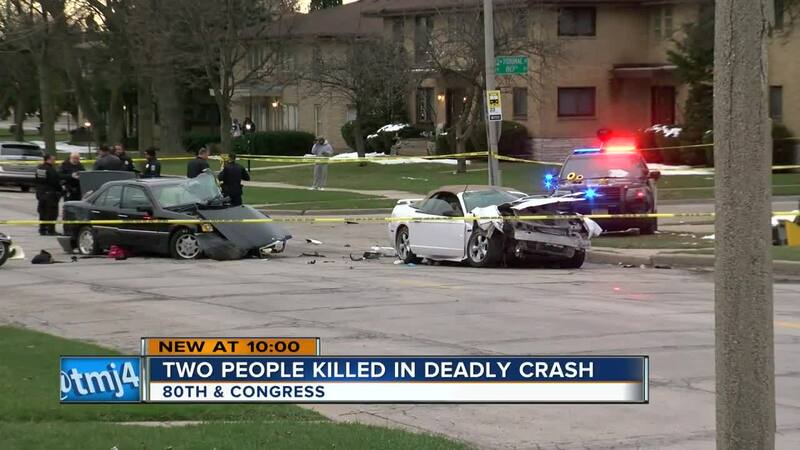 Two people were killed in a car crash Monday evening on Milwaukee's northwest side. MILWAUKEE -- Two people were killed and two people were seriously injured in a two-vehicle crash Monday evening on Milwaukee's northwest side. It happened just before 6 p.m. at the intersection of N. 80th Street and W. Congress. According to Milwaukee Police, a 65-year-old man and a 66-year-old woman were struck by a car making a u-turn. They suffered severe injuries and died at the scene. Police identified the victims as Peter A. Garton and Joan L. Garton. Two other people were transported by the Milwaukee Fire Department to Froedtert Hospital for treatment of serious injuries. One firefighter was also transported to the hospital after they were exposed to bodily fluid. The driver of the striking car was question and released. Police say he is cooperating and they are continuing to investigate the incident.